Lanikai’s scenic coast and family-friendly orientation are what makes this community a wonderful place to call home. Situated on the Hawaiian island of Oahu, Lanikai is home to beautiful beaches, grand scale homes, and welcoming neighbors. The community’s boundaries are fully encompassed in the town of Kailua, whose downtown area is brimming with shops and restaurants that also serve the residents of Lanikai. Lanikai home buyers will love the quiet neighborhood, modern real estate opportunities, and direct coastal access to one of the most beautiful beaches in the world. Lanikai has many attractions and amenities that make it a great place to live, work, and play. Suitable for an active, outdoor lifestyle, Lanikai contains numerous hikes, a golf course, and a powdery white sand beach. Residents enjoy the beauty and wildlife of the island, whether it’s hiking the Pillbox Hike, or spending the afternoon at Lanikai Beach, which is a half mile long strip of white sand with warm waters where residents can relax and unwind. 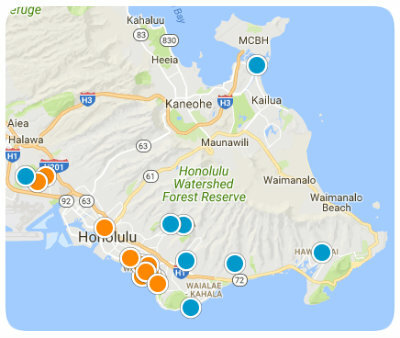 Additionally, Lanikai residents are a five-minute drive from the Kailua town center, which hosts amenities such as local supermarkets, numerous schools, dining, and public parks. There is a vast array of real estate opportunities in Lanikai, with living space ranging from 2,500 to nearly 8,500 square feet. The Lanikai neighborhood is fairly small, as Aalapapa and Mokulua Drive are the main roads that sweep through the length of the community. Located at the base of the Ka’Iwa Ridge, the Lanikai neighborhood is known for its extravagant real estate, with beachfront estates and luxurious mansions populating the community. Depending on the property’s size, style, and location, there is a wide price range that will accommodate prospective home buyer’s budgets. Home buyers from across the island of Oahu will fall in love with the abundance of amenities, remarkable real estate, and breathtaking views in every direction. If you would like more information regarding homes for sale near Lanikai, please allow us to assist you and contact us today.